Jonathan decides to attack the Philistines single-handedly with just his armor-bearer by his side. They both climbed up a cliff to where the Philistines were who told Jonathan to come to them. They took Jonathan’s approach as all of the Israelites were crawling out of their holes. They killed 20 Philistines. The Lord struck confusion on the Philistines in their camp. Saul saw this and rallied his men to join in the attack. All the Israelites who had hidden came out to help in the battle when they heard what was happening. The Lord rescued the Israelites. Saul had cursed his army not to eat, all of whom were ravished and hungry. Jonathan eats honey he finds, not knowing about his father’s curse. When he is told of his father’s curse, he ignores it. The men slaughtered the animals of the Philistines and ate all of it, including the blood, because they were so hungry. Saul sacrificed to the Lord and then wanted to kill his own son for eating honey, but the men saved Jonathan, saying he was the one who defeated the Philistines. Saul continues conquests against the surrounding peoples and enemies of Israel. God orders Saul to punish the Amalekites for unprovoked attacks when the Israelites were leaving Egypt (Exodus 17:8-16; Deuteronomy 25:17-19) and totally destroy them. Saul did not obey the Lord. He did not destroy everything, keeping the best of the plunder. God is grieved by Saul’s misbehavior who has since set up a monument to himself. Saul claims the good plunder is to be sacrificed to the Lord. Samuel says obedience is better than sacrifices. He informs Saul God has rejected him as king. Only then does Saul admit he sinned, and Saul begs to be forgiven. Saul says God does not change His mind. Samuel is the one to put the king of the Amalekites to death. Samuel returns home to Ramah, grieved over Saul. 13) Personal Question. My answer: It encourages and inspires me that I can make a difference at just one person in this world. We all make a difference every day — I just think we don’t acknowledge it. I like how Jonathan is the wisdom here, eating honey and saying how his father is an idiot for that curse. Jonathan also is inspiring to see how he relies on God and bucks the trends when God says to do so. 14) Saul basically lets others do the hard work, and then he swoops in to claim all the credit. He waits until things are going his way to act. To me, he’s weak-willed and only a leader in good times, not bad. 15) Part personal Question. My answer: Saul claims he was saving the best of the best to sacrifice to God, and he says how he was afraid of the people so he gave in (he blamed others essentially). We do the same thing: blame others for our actions. We procrastinate, saying now is not the right time. Or we say let someone else do it. 16) Personal Question. My answer: God wants total obedience. Even if we think we’re doing something for good and God says otherwise, follow God. He has his reasons for asking us to do things and we, not being omniscient, just need to obey. We can’t assume we know better than God. It’s easier just to follow God anyways. It takes all the decision making out of the equation. Following God is easier than you think: you just do it. I love these chapters. You see Jonathan taking matters into his own hands with God and you see Saul taking matters into his own hands against God. The results? Saul is rejected. Jonathan is saved. Nothing says it better. The armor bearer was just that — bearing the armor of the officer he served. He as like the squires of the Middle Ages–the person assigned to help the officer do his duty. There are many stories in the bible where God multiplies forces (Judges 3:31 described Shamgar’s victory over 600 Philistines with a sharp stick and Leviticus 26:8 saysFive of you shall chase a hundred, and a hundred of you shall put ten thousand to flight; your enemies shall fall by the sword before you. This is where Jonathan is coming from. He’s going to rely on God and see what he’ll do. He does not tell his father who was lazily sitting under a tree. Jonathan did not do this for glory because he did not tell anyone of his plans. God guided Jonathan to a narrow path through a pass with large, sharp rocks on either side — the perfect place to fight a few men at at time. Why did Jonathan step out in faith and risk his own life? Someone had to have faith. The situation for the Israelites was dismal: greatly outnumbered. Someone had to allow God to use them. Someone had to allow God to prove His word and that He was still with the Israelites. What do we learn from Jonathan’s example? Only unbelief restrains God (Matthew 13:58). God’s power is never restrained. Jonathan’s armor-bearer encourages and supports Jonathan. When something is done in God’s name, support always follows. Jonathan tests God, but he tests God out of faith. Gideon doubted God’s word (Judges 6:36-40); Jonathan doubted himself. The battle was God’s, but Jonathan still had a role to play by fighting. God uses the swords of the Philistines against themselves since the Israelites had no swords. Saul procrastinates. He wants to see who is doing his job (and who’ll get the credit for it), and he wants to pray. The time to fight is now, which he eventually does. Why the curse of Saul on his own men? Saul’s curse was personal — so he could take vengeance on the Philistines. It was God’s honor and the security of his people he should have been fighting for. Saul did not have the authority to order a fast — only Samuel, a priest, did. Pursuing an army takes energy. God provided the honey for the men to replenish themselves. Jonathan understood this and said as much. God commanded Israel to drain the blood from an animal before butchering it (Deuteronomy 12:23-25). The disobedience here stemmed from the people obeying Saul’s foolish command and them being so hungry they ate with the blood still in the animals, which resulted in disobeying God’s. Legalistic rules lead us into sin because they either provoke our rebellion or they lead us into legalistic pride. Saul being Saul, blamed the people for their disobedience when it was his fault. 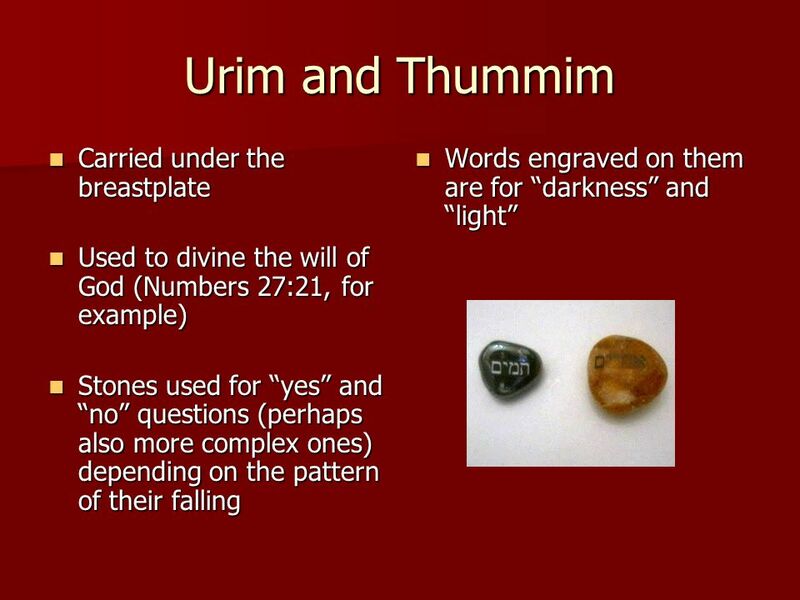 Urim and Thummim are mentioned in the Bible (Exodus 28:30, Numbers 27:21, 1 Samuel 28:6; Ezra 2:63, Nehemiah 7:65) and may have been used elsewhere to inquire of God (Judges 1:1 and Judges 20:18, 23). Saul wants to spare Agag (Chapter 15), but kill his own son. Saul wanted to find the wrong doer by the casting of lots. They separated the people into two groups, and then selected one group by a “low” or “high” roll of something like dice. The group was narrowed until they found the one. This was meant to show he was innocent. “Perfect lot” in the Hebrew is very close to the word for Thummim. They probably used the Urim and Thummim as the way to cast the lot. Saul was willing to kill his son rather than to humbly admit that he was really at fault. All humility Saul had (1 Samuel 10:21), is now gone replaced by pride. The oath itself to put Jonathan to death was foolish and should not have been enforced. Jonathan broke the oath in ignorance. Jonathan’s bold faith in God had much more to do with the victory on that day than Saul’s foolish oath. In fact, the victory would have been greater otherwise. Totally destroy: This Hebrew verb (heherim) is used seven times in this account. The idea of total, complete judgment is certainly stressed. This verb refers to the irrevocable giving over of things or persons to the Lord, often by totally destroying them. Then the LORD said to Moses, “Write this for a memorial in the book and recount it in the hearing of Joshua, that I will utterly blot out the remembrance of Amalek from under heaven.” And Moses built an altar and called its name, The-LORD-Is-My-Banner; for he said, “Because the LORD has sworn: the LORD will have war with Amalek from generation to generation.” (Exodus 17:14-16) Deuteronomy 25:17-19 repeats this idea. The Amalekites committed a terrible sin against Israel. When the nation was weak and vulnerable, the Amalekites attacked the weakest and most vulnerable of the nation (Deuteronomy 25:18). They did this for no reasons except violence and greed. God hates it when the strong take cruel advantage over the weak, especially when the weak are His people. Why did God wait to punish the Amalekites? God through his mercy gave the Amalekites 400 years to repent. They did not. Time does not erase sin before God. Men should be forgiving of one another because we are not the judgers. Only Jesus can erase sin. God used the Amalekites as a test of obedience for Saul. God wanted to make the judgment fit the sin. Would God call His people today to fight a war of judgment? Under the New Covenant, we are called for (John 18:36). Saul is merciful in letting the Kenites go. Most armies worked for the plunder of the people they were conquering in ancient times. But with the Israelites, when the battle was for judgment, they were not to benefit in any way. What lesson do we learn from Saul? Partial obedience is complete disobedience. There is nothing happy about plundering towns and killing people. God judges reluctantly. Samuel had God’s heart. It hurt God to reject Saul, and it hurt God’s prophet to see him rejected. We are close to God’s heart when the things that grieve Him grieve us, and the things that please God please us. Saul wasn’t grieved over his sin. Saul was quite pleased with himself! There is not the slightest bit of shame or guilt in Saul, even though he directly disobeyed the LORD. David, in contrast to Saul, was known as a man after God’s own heart (1 Samuel 13:14). Even though David would also disobeyed God, David felt the guilt and shame one should feel when they sin. Saul didn’t feel it. His conscience was dead to shame, and his heart was dead to God. Saul’s heart was so dead he could directly disobey God and still set up a monument for himself on the occasion. Saul had such potential as we saw in (1 Samuel 9:21) and (1 Samuel 10:22). Humans are the same no matter what–evil. Saul let the evil prevail instead of letting God have his heart. What lesson do we learn from Saul’s pride and monument to himself? Pride and disobedience make us blind – or deaf – to our own sin. We need to constantly ask God to show us our sins: Psalm 139:23-24: Search me, O God, and know my heart; try me, and know my anxieties; and see if there is any wicked way in me, and lead me in the way everlasting. This says it all (verse 15): “the Lord YOUR God.” Saul did not consider God his anymore. Tragic. Saul did not even destroy the rest; there were still Amalekites left alive. David later had to deal with the Amalekites (1 Samuel 27:8, 30:1, 2 Samuel 8:12). Haman, the evil man who tried to wipe out all the Jewish people in the days of Esther, was a descendant of Agag (Esther 3:1). When Saul was killed on the field of battle, an Amalekite claimed to deliver the final thrust of the sword (2 Samuel 1:8-10). When we don’t obey God completely, the “leftover” portion will surely come back and trouble us, if not kill us. Saul again throws his own people under the bus even though they were only following orders. God knew Saul’s heart — he would never be obedient to HIm. Rebellion lived in his heart. Saul rejects his sin — with a caveat — the blame game again. We see Saul’s desperation in the ripping of Samuel’s robe. Saul is desperately clinging onto pride and stubbornness instead of clinging to God Himself. 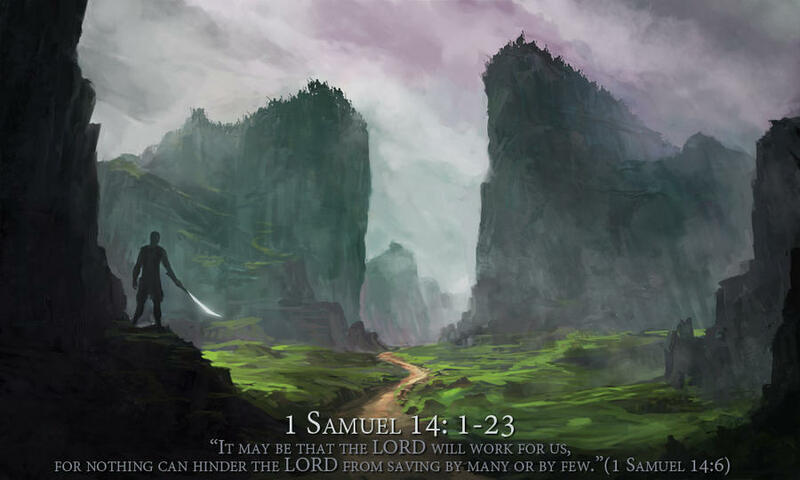 Fun Fact: Samuel uses a title for the LORD found only here in the whole Bible: The Strength of Israel or the Glory of Israel, reminding Saul who is in charge. Saul is far more concerned with his image than his soul. Saul remains in power only because David is not ready yet. Samuel completes God’s command and kills the king of the Amalekites himself by hacking him to pieces. He does this before the Lord and for the Lord. 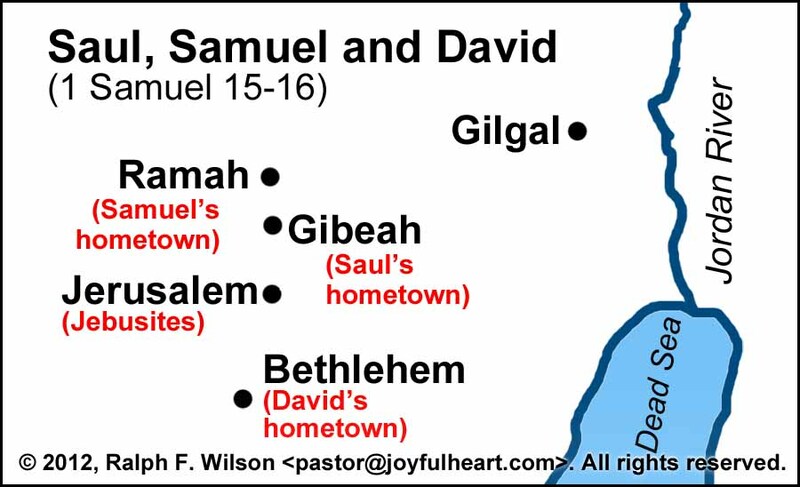 Sadly, Saul never came to see Samuel even though Ramah and Gibeah were less than ten miles apart. Saul needed to come to Samuel to repent. He never did.